These helpful buffer zones allow an orderly exit—and reentry—with a place for everything. 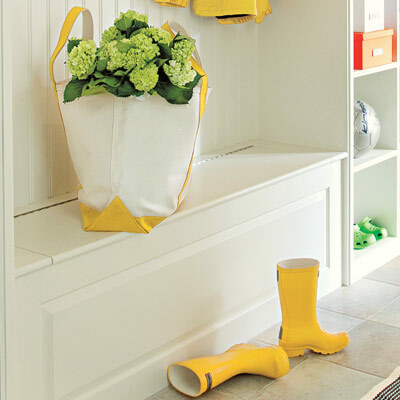 This one-wall mudroom can handle a season’s worth of athletic gear and outerwear. Tip: Cheer up a utilitarian space with a colorful indoor-outdoor runner. To clean it, just shake it out or hose it down. 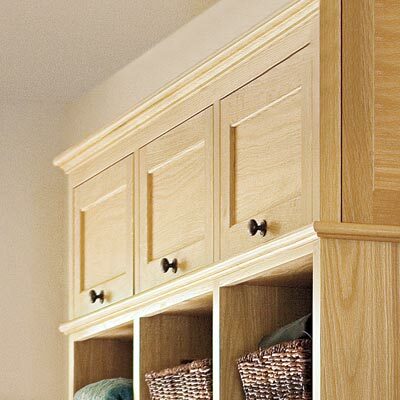 Ample 16-inch-deep cubbies mean each family member has places to stash footwear, sports equipment, toys, and more. 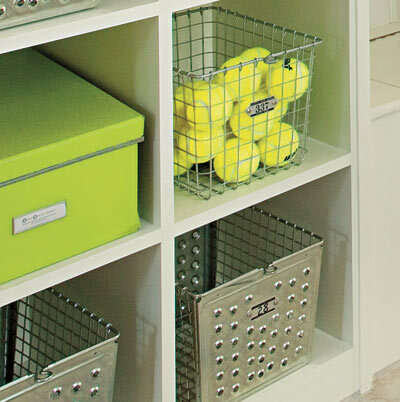 Metal bins, fabric-lined baskets, and color-coded boxes organize small items and store off-season goods. 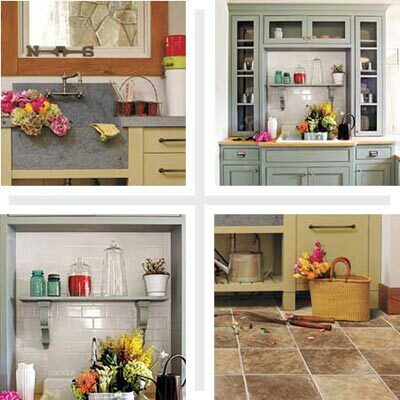 High-gloss paint resists scuffs, and stone-look porcelain floor tiles won’t show scratches. Both are a snap to clean. 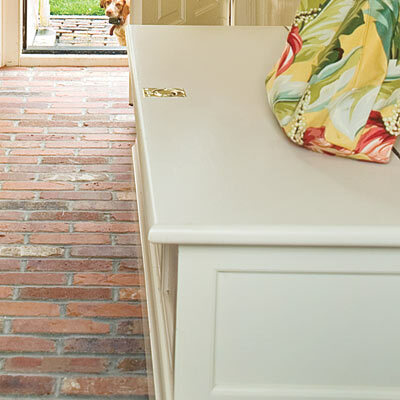 A furniture-grade storage unit mounted alongside stairs turns a front foyer into a mini mudroom. 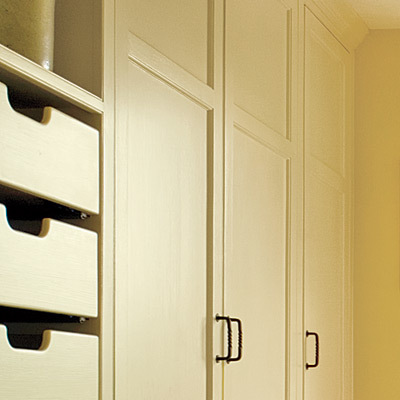 Open lockers with hooks have handsome curved frames that make the unit formal enough for a front entry. 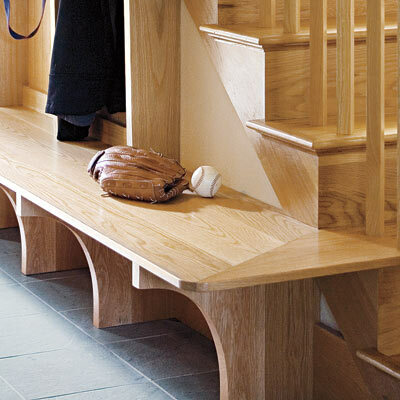 The oak, chosen to match the stairs, is finished with water-shedding polyurethane. Tip: Lockers should be at least 2 feet wide so that there’s space for each person’s bags and outerwear. Rarely used items, like binoculars, are tucked up top behind flip-up doors. 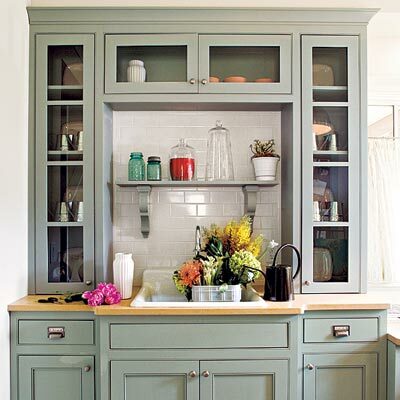 The 10-foot bench projects nearly 2 feet from the wall to provide a safe toehold for reaching top cabinets. Arched supports echo the locker frames and divide the slate-tile floor into landing spots for shoes. 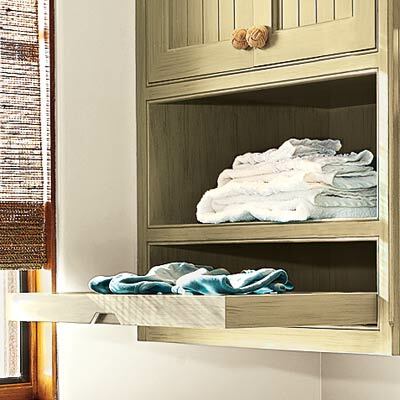 Exposed hooks and discreet closets and drawers create a high-functioning, clutter-free drop zone. Eight-foot-high doors hide away baskets of balls and outerwear not worn every day. 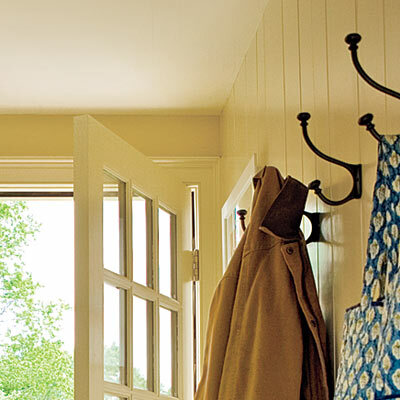 Jackets and bags practically hang themselves up on generous hooks above the bench. 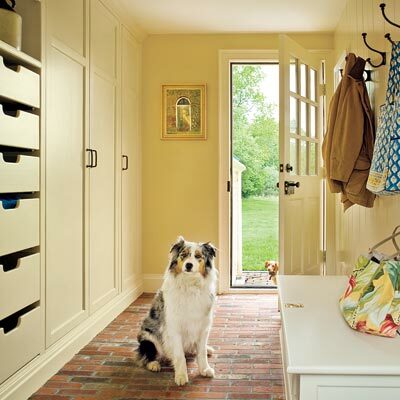 Small, clutter-creating items, such as dog leashes, gloves, and sunscreen, are concealed inside large drawers. Roomy cutouts offer a glimpse of what’s inside and a comfortable handhold. Along with providing a spot for slipping shoes on and off, this perch’s lid opens up to stow baseball bats and lacrosse sticks. Tip: Make cleaning up after muddy feet (and paws) a cinch by sealing porous bricks with a clear coat for masonry. 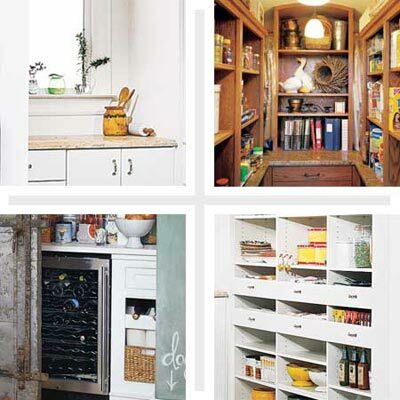 These kitchen offshoots keep supplies centralized and out of the cooking zone. 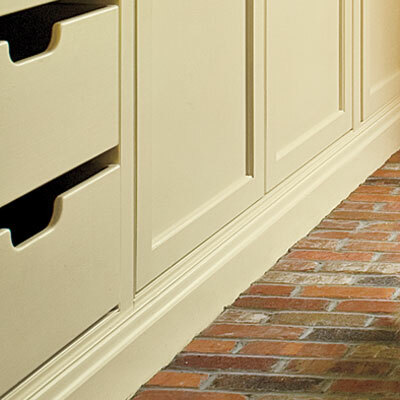 Warm finishes keep the look as polished as the adjacent kitchen, inspiring a sense of order. 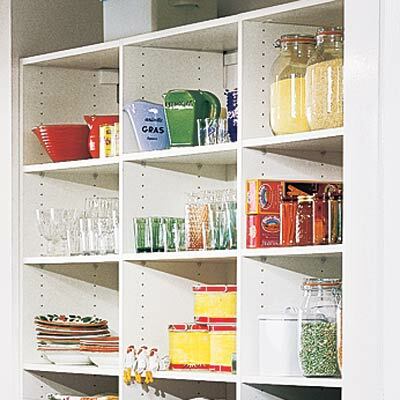 These shelves can be raised or lowered to accommodate everything from canned goods and recipe binders to candlesticks and centerpieces. 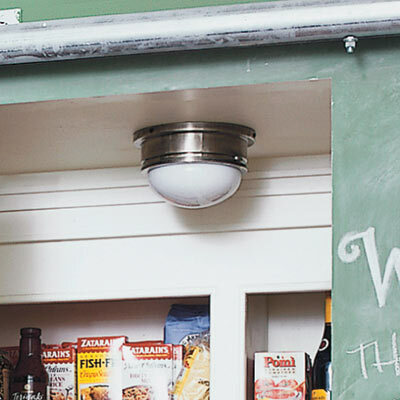 Tip: To amp up lighting in a closed pantry—and add a style boost—hang a pair of pendants instead of just one. Rods flanking the center unit allow table linens to hang wrinkle-free, while slim, felt-lined drawers keep silverware from tarnishing. 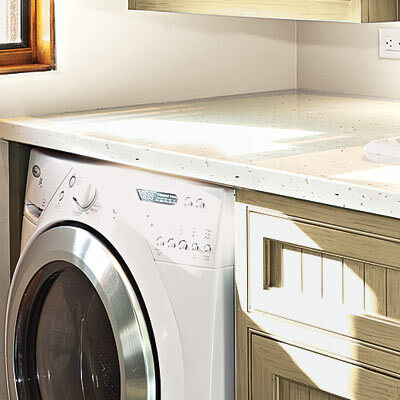 The granite countertop looks luxe, complements the richly hued wood, and wipes down easily. 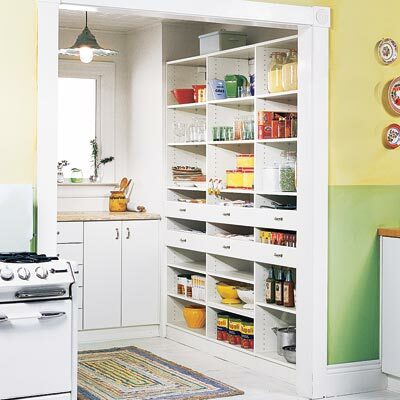 Photo: Courtesy of California Closet Co.
Lots of light makes this pantry alcove a practical dishware-storage and food-prep station. Full-extension hardware ensures access to every inch of these pullouts. Tip: Stash heavy and frequently used items at waist height. 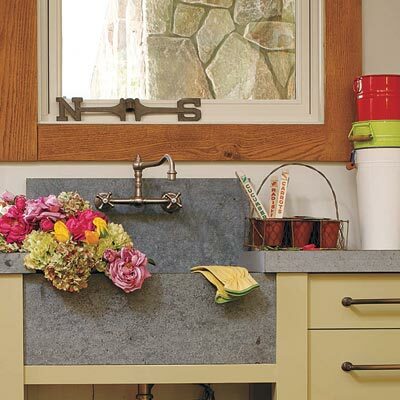 A 25-inch-deep laminate countertop provides a convenient work surface. 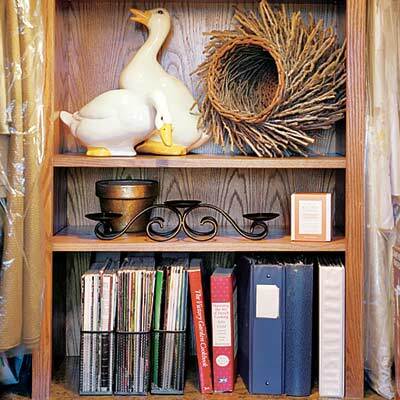 Serving items sit at the ready on open shelves—and double as decor. 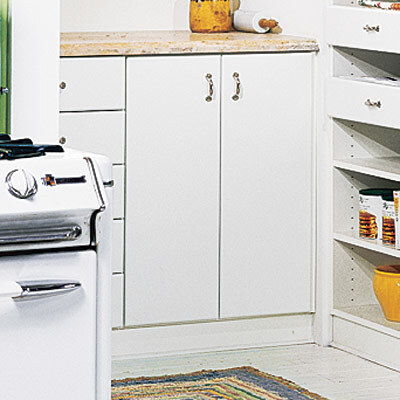 Small appliances and bulk grains can be kept cool, dark, and dust-free behind closed doors. 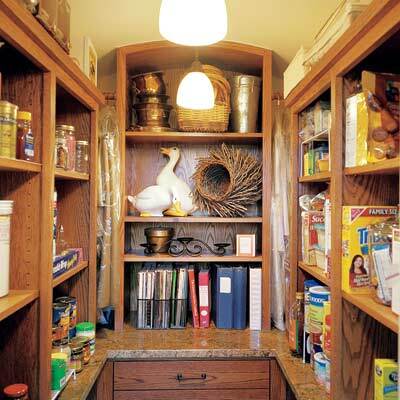 A fully loaded grid of open shelves and cabinets can disappear behind a functional piece of salvage. 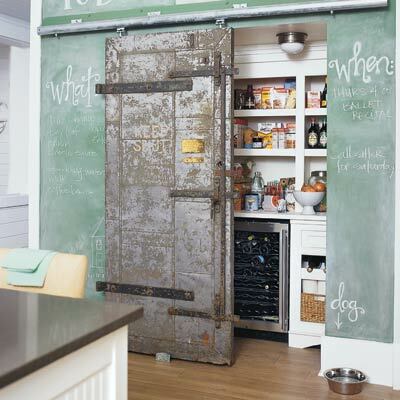 The weathered bank-vault door, mounted on a heavy-duty track, adds character, hides clutter, and—unlike a swing-open door—won’t block traffic. 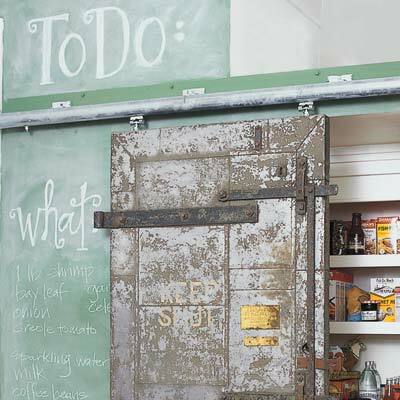 Tip: Chalkboard paint can turn a wall or door into an erasable shopping list and message board. A small, nickel-finished ceiling fixture reinforces the kitchen’s vintage look while illuminating items at the back of shelves. 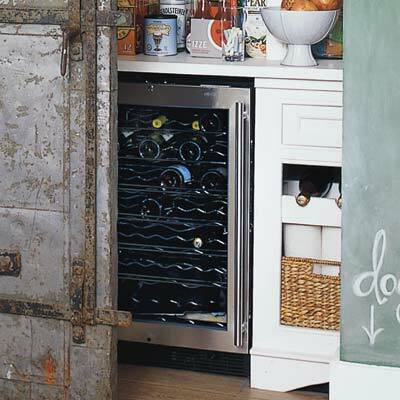 Outlets allow for stashing a wine cooler and other small appliances to clear space in the cooking area. First-class finishes and a fun hit of color make for a pleasant gardening place. 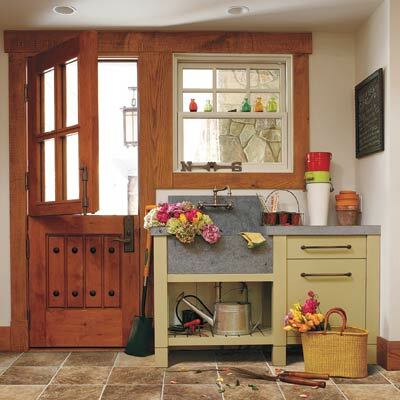 A Dutch door blocks pets while inviting air and light into a workstation for potting plants and filling vases. 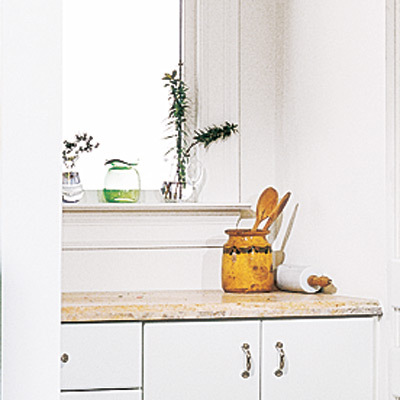 Soapstone has an earthy, traditional look, and chips and wear only add character. 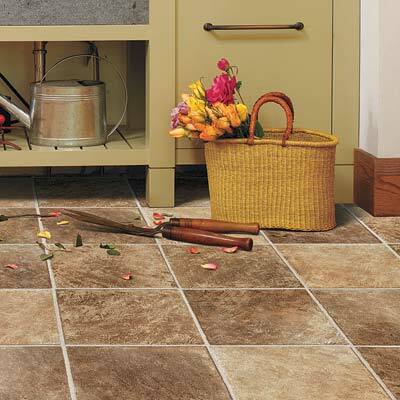 Water and potting soil mop up fast when there’s no grout to catch them. 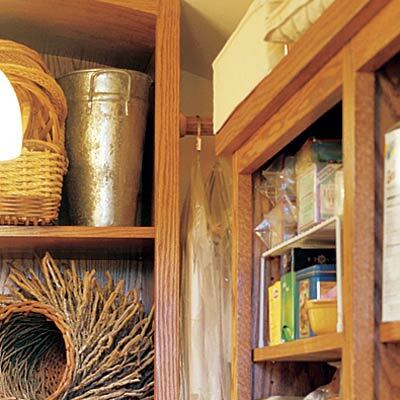 Tip: Line a deep drawer with a heavy-duty plastic bag to serve as a soil bin. A furniture-like potting center combines glass-front and solid cabinet doors for display and storage. 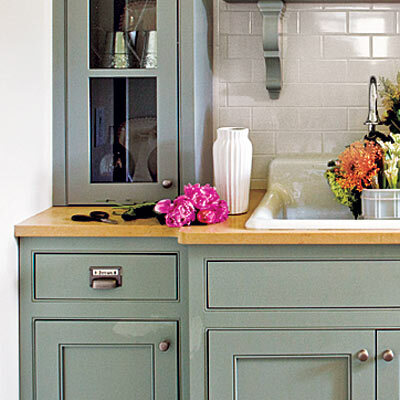 An extra-deep (nearly a foot) cast-iron basin with a raised lip helps contain splashes. 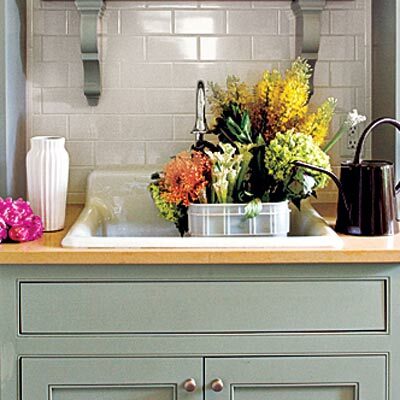 Classic subway tile gives this cottage-inspired setup a pretty-yet-practical backdrop. 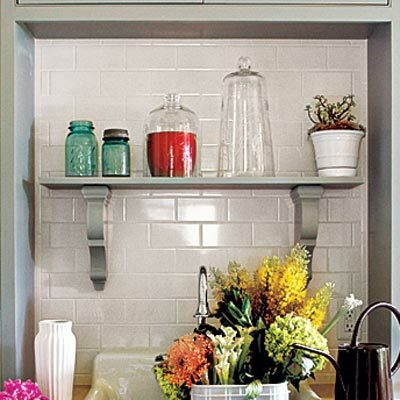 An open shelf mounted on corbels is a showcase for cloches, colorful containers, and potted plants. The nonporous Corian countertop mimics wood but stands up to assaults from liquid fertilizer, thorny rose branches, and heavy ceramic pots. 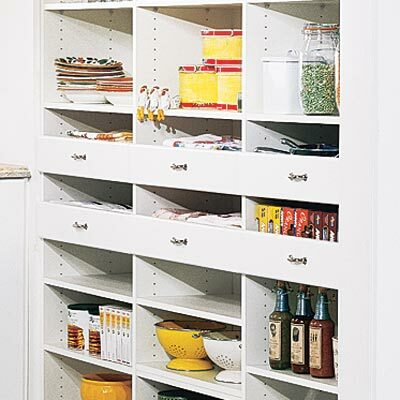 Tip: Keep track of drawer contents with bin pulls that have apothecary-style label holders built right in. 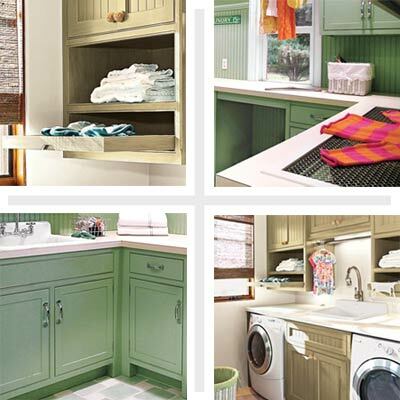 These well-organized, well-lit rooms help take the dread out of wash day. The U shape offers space for sorting, washing, folding, and hanging. 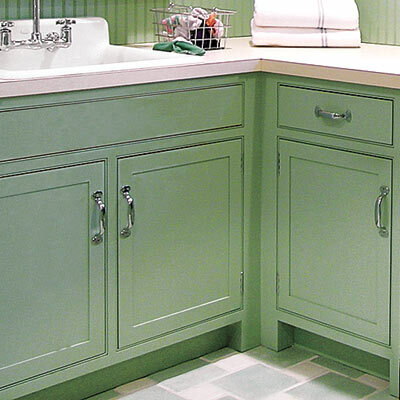 Custom cupboards painted a vintage green—complemented by a tall beadboard backsplash with a plate rail for displaying artwork—look inviting and accommodate every laundry necessity, as well as ironing and sewing supplies. A long run of solid surfacing holds stacks of folded clothes. 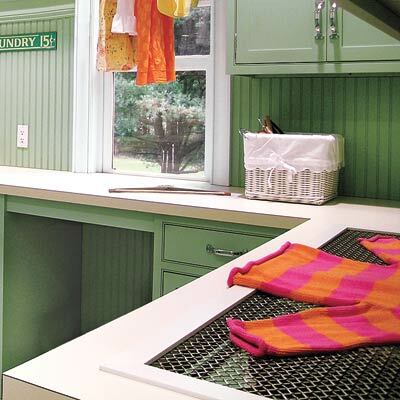 Tip: Create an under-counter spot for a laundry basket so that it won’t be underfoot. 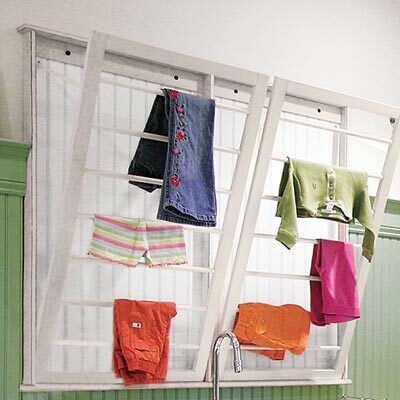 Charming hinged wood wall racks latch at the top when not in use. 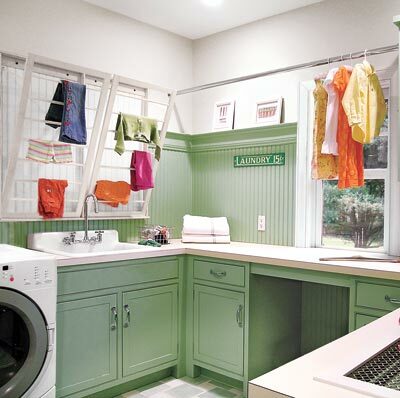 A shower-curtain rod in front of the window allows damp laundry to get a full dose of fresh air. A coated-metal mesh rack set into the countertop keeps knitwear flat for drying. 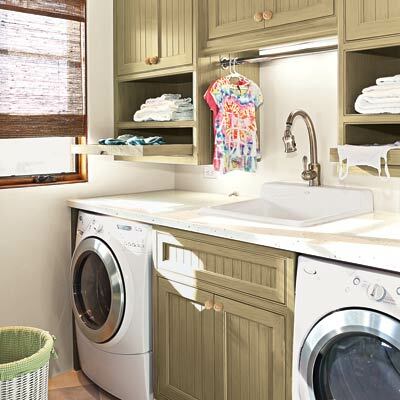 Everything is within easy reach in this compact, light-filled laundry center. Front loaders topped with a quartz slab create a space-saving folding area. 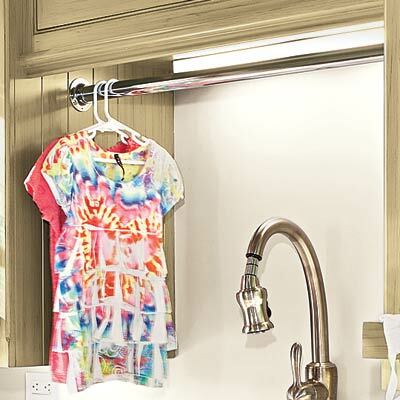 Laundry on hangers can drip-dry over the sink. 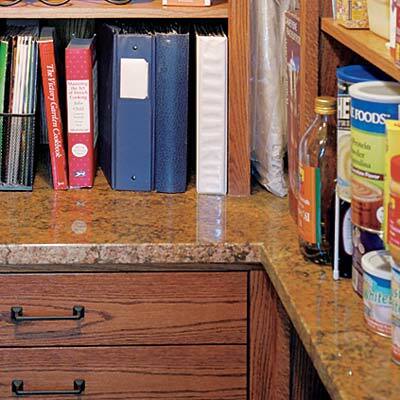 Tip: Install under-cabinet lighting to make treating stains easier. 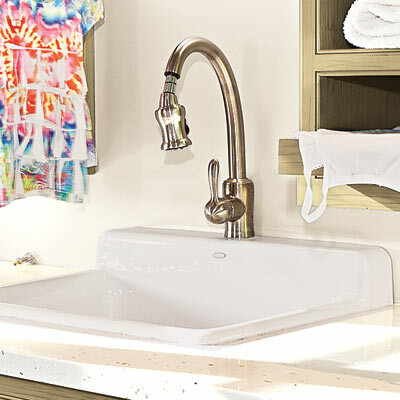 An adjustable spray helps with rinsing out hand-washables.